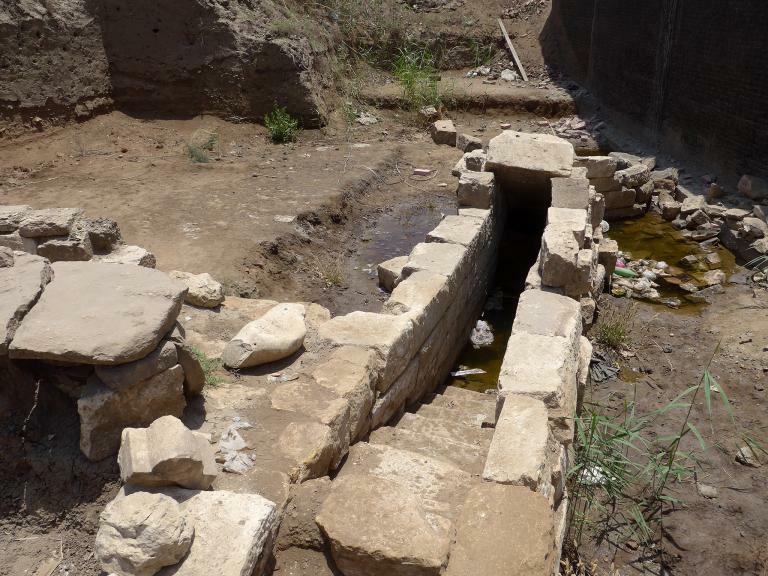 Stone steps uncovered at the ancient port city of Thmuis are part of a nilometer, a structure used in antiquity to monitor the level of the Nile River. American and Egyptian archaeologists have discovered a rare structure called a nilometer in the ruins of the ancient city of Thmuis in Egypt’s Delta region. Likely constructed during the third century B.C., the nilometer was used for roughly a thousand years to calculate the water level of the river during the annual flooding of the Nile. Fewer than two dozen of the devices are known to exist. Before the completion of the Aswan High Dam in 1970, the Nile flooded the surrounding plains each year in late July or August. As the waters receded in September and October, they left behind a blanket of fertile silt that was essential for growing crops such as barley and wheat. But the volume of the yearly flood varied widely. If the inundation was inadequate, only a small area of cropland would be covered with the life-giving silt, often resulting in famine. If the water level was too high, it would sweep away houses and structures built on the plain and ruin the crops. It’s estimated that the flooding was either inadequate or excessive roughly once every five years during the pharaonic period. Made from large limestone blocks, the nilometer was a circular well roughly eight feet (2.4 meters) in diameter with a staircase leading down into its interior. Either a channel would have connected the well to the river, or it would have simply measured the water table as a proxy for the strength of the river. Seven cubits—roughly 10 feet (3.04 meters)—was the optimum height for prosperity. Archaeologists believe the nilometer may have been part of a temple complex on the banks of the Nile, which has since changed course. A list of names carved in Greek was inscribed on a limestone block in the nilometer. Each name is followed by a number, which suggests the individuals recorded were beneficiaries who contributed funds to build the structure. In the third century B.C., Egypt was ruled by the Ptolemies, a line of Greek royalty who assumed power there after the death of Alexander the Great. In antiquity there were at least seven branches of the Nile, while today there are only three. As some channels of the river dried up or shifted course, the locations of human settlements also changed to follow the Nile. Previous archaeological excavations have indicated that the ancient city of Mendes was already declining by the fourth century B.C. The rise of Thmuis, located roughly half a kilometer south of ancient Mendes, appears to have arisen to accommodate the changing course of the Nile. Thmuis means “new land” in Egyptian. 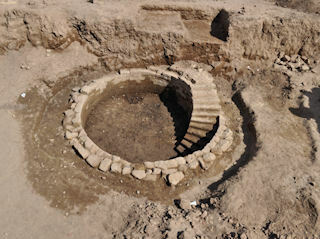 The discovery of the ancient nilometer confirms the location of the paleochannel of the Nile along the western side of Thmuis. Today the Nile has shifted yet again. The largest city in the region is now El Mansoura, situated on the banks of the Nile, while Thmuis has dwindled to a small village. The site of the nilometer was likely part of a sacred temple complex where priests used the structure to predict the seasonal floods and farmers left offerings in hopes of winning the river god’s favor. The area is now home to a soccer field, a meat processing plant, a cemetery, and a garbage dump. But traces of the river and its sacred significance linger in the local landscape and culture. The water table is still high enough to be accessible, and workmen digging the foundation of a water pumping station discovered the nilometer. One of the Egyptian excavators recalled a story from roughly 30 years ago. A young woman from the area was rolling down the side of a hill in the Muslim cemetery above the nilometer. She explained that this was a custom linked to the area’s traditional associations with fertility. Young women hoping to become pregnant had done the same for generations. The Nile had shifted its course long ago, but its life-giving power persisted in local customs.